There are two paths the reader can potentially go down to reach the aforementioned goal of the book. First, they could come up with a product such as a, herbal supplement, like the author did. After this product is made, you outsource everything. Production, Calls, Marketing, Sales.... Everything! This is done by using outsourced production companies, calling centers, using India-based virtual assistants, and website only sales. Ferriss does a tremendous job of laying out the "how-to," so keep your cynicism at bay until you have done the homework. It's not as crazy as it sounds. The second path the reader can go down is to negotiate a work-from-home career. He shows how most jobs can be done over skype, email, and conceptshare.com. I think that a lot of people think that it is impossible for them, but you may be surprised. After the reader negotiates to work from home, you may try to work from a trip and then before you know it... you are able to take mini-vacations and still work. The focus of the book was not meant for me. I do not have a traditional 9-5 job and what I do have does not need escaping. But I know a lot of people that do not like their job or someone that is unemployed and would like something different. In that case, the focus of this book is something worth looking into. Speed Reading- Yes, this is where I learned how. Since I read the "how-to" the first time I have gotten much much faster, but this is the book that gave me the foundation to increase my reading speed and gives me time to do this blog and everything else I have going on. I cannot tell you how advantageous this has been for me. The skills I have learned through the books I have read will be forever transferable. Make hotel reservations, book plane tickets, find a dealer to get your car fixed, schedule your appointments, screen your emails, pay your bills, chart a diet plan, get weather forecasts from 5 years ago for a specific area (Tim says this was used in a settlement case), send birthday flowers, pay tickets, post job vacancies of the web, or transcribe voice mails and email them to you. Traveling- I have used a couple tips laid out in this book and it saved me hundreds of dollars. One tip I learned is when you are looking for a place to stay abroad don't look for hotels or hostels. Instead, look at apartments or houses. The cost of living in a foreign country isn't that much different from what we have in the US (the currency exchange is, but not the cost of living). So sign a month to month lease with a leasing agent and have an apartment overseas for $600-1000 for A MONTH instead of a hotel that would cost $200 A NIGHT or a hostel the would cost $100 A NIGHT. Another tip that can be applied to your everyday routine is to wake up with a kitchen timer instead of a alarm clock. You can set it for the exact amount of sleep you want (6, 7 ,8 hours) and you get the rest you need and don't waste time. If you start this in your everyday routine then you can experiment with caffeine use and find what is the best practice to get you energized. When you are looking for the cheapest airfare or hotels use http://www.kayak.com/ It searches a database of travel websites to give you the best rate and you can also opt to search other travel sites at the same time. Also, when purchasing your plane tickets, do it either months before or minutes before. Minutes before is preferred because you can get amazing deals. An empty seat on a plane brings in $0 for the airline, so this is your opportunity to get a great price. Happiness- In our society it seems that people have a negative connotation with happiness techniques. I think that is ridiculous. Happiness something just as controllable as your personal finance and deserves your time. And if you want some incentive, companies are much more likely to promote a happy person than they are a continuously melancholy person. Ferriss recommends that every morning when you wake up to go for a brisk 30 minute walk and bounce a tennis ball. This will pump your endorphins, making you beam with happiness for the rest of the day. Ferriss also recommends some helpful emailing habits... Batch your emails and never check them first thing in the morning or last thing at night. Batching them will make you more efficient because you won't be checking them every 20 minutes eating up all your time. I recommend checking them at 10am and 4pm. And also he recommends not checking them first thing when you wake up or last thing before you go to sleep because emails have a potential to give "bad news"... or at least something you have to "deal with." There is no reason to get yourself worked up about these things and potentially lose sleep or set your day off on the wrong foot. Real emergencies rarely happen and if they do, someone will be calling, not emailing. 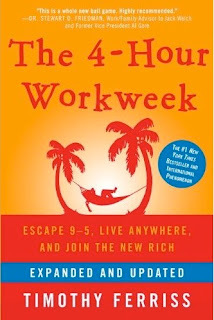 This book is very good and Tim Ferriss has a lot of great information. He is a great role-model. And he isn't just a writer, he has done a lot with his life and continues to push himself to learn and do new things. He now speaks 6 languages (self-taught), runs a multinational firm wirelessly, he is a Princeton Lecturer, holds a Guinness World Record for the Tango, National Chinese Kickboxing Champion, he is a horseback archer, MTV breakdancer in Taiwan, Hurling Competitor in Ireland, and an Actor on a hit TV series in China and Hong Kong- Human Cargo. I have heard a lot of people be skeptical of this book for the last 2 and half years that it has been on the New York Times Bestsellers list, but I urge you to give it a chance. The thing I like most about this book is that it has so many great take-aways not directly related to the main focus of the book. If you have any questions on the book don't hesitate to ask. I would be more than happy to help anyone that wants it. Some may find it surprising but it is possible as long as you're willing to do it.